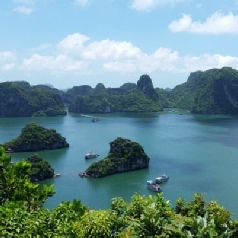 A fabulous introduction to Vietnam takes in the two key cities of Hanoi and Saigon, with a week on the beach at Danang, for easy access to Hoi An - a day trip to Halong Bay is also included! On arrival, you'll be met at the airport and transferred to the Sunway Hotel Hanoi for a four night stay. Our stopovers in Hanoi are extremely flexible so if you’d prefer a shorter or longer stay just ask! Spend the next few days exploring fascinating Hanoi. Visit historic sights such as the One Pillar Pagoda and the Temple of Literature, both easy to get to. Set off on the adventure of a lifetime, sailing through the wonderful rocky islands and natural caves of this breathtaking UNESCO World Heritage Site. After being collected from your hotel, enjoy the picturesque countryside during the drive to Halong Bay (Approx. 3.5 hours). A toilet/refreshment stop will be made along the way. Upon arrival at Halong, embark for a 4-hour boat trip on a traditional Vietnamese junk and cruise through the huge limestone rocks on the Bay’s emerald water. After lunch, visit one of the most beautiful caves of the Bay called Thien Cung Cave.The tiny islands are dotted with innumerable beaches and caves that make an excellent backdrop for swimming or just lazing about on the boat deck. At the end of the afternoon the boat takes you back to the harbor where your minibus will be waiting to take you back to Hanoi (arrival around 20:30). to and well worth doing so. Transfer back to Hanoi airport for your onward flight to Danang. On arrival you’ll be met and transferred to the Centara Sandy Beach Resort for a seven night stay. A wide range of hotels is available and durations are flexible, so you can stay for as long as you wish. Spend the rest of your stay in Danang relaxing on the beach, or exploring the nearby historic towns of Hoi An and Hue. The beaches around Danang are almost endless, but there’s plenty of interest in the region too. Transfer back to Danang airport for your onward flight to Saigon. On arrival, you'll be met at the airport and transferred to the Liberty Central Hotel for a three night stay. Our stopovers in Saigon are extremely flexible so if you’d prefer a shorter or longer stay just ask! Spend the next few days exploring fascinating Saigon, and perhaps explore the nearby Mekong Delta.